What is Food $ense? Food $ense is Washington State’s Supplemental Nutrition Assistance Program Education (SNAP-Ed). It is a hands-on, culturally sensitive nutrition education program available to Washington Basic Food (food stamp) recipients and schools where 50% or more of the students receive free or reduced-price meals. 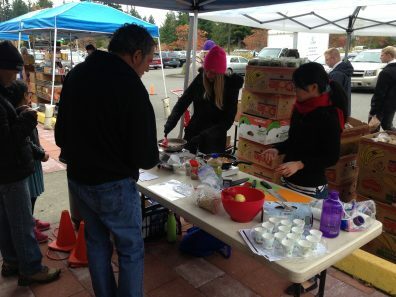 This nutrition education program reaches youth and adults in Snohomish County with information to help families practice healthy eating habits and become more physically active. Have you ever wondered what to do with a daikon radish? Turnips? Beets? Did you know you can use a peeler to thinly slice zucchini to make ‘zoodles’ for a fun way to add veggies to your meal? WSU Extension Food $ense helps people learn how to use those veggies, and more, by providing cooking demonstrations and recipes at three food banks in Snohomish County. WSU Extension programs and employment are available to all without discrimination. Evidence on noncompliance may be reported through your local WSU Extension Office. Follow the link to the Washington State SNAP-Ed for additional tips, recipes & resources!